Now that you’ve signed up for your panels, time to figure out where you’re going to sleep! It’s a very busy weekend in Madison and the hotel is filling up fast: currently the only way to book a room at the Concourse is through the WisCon room block. That means once our block is full, there won’t be any more rooms. So act fast! 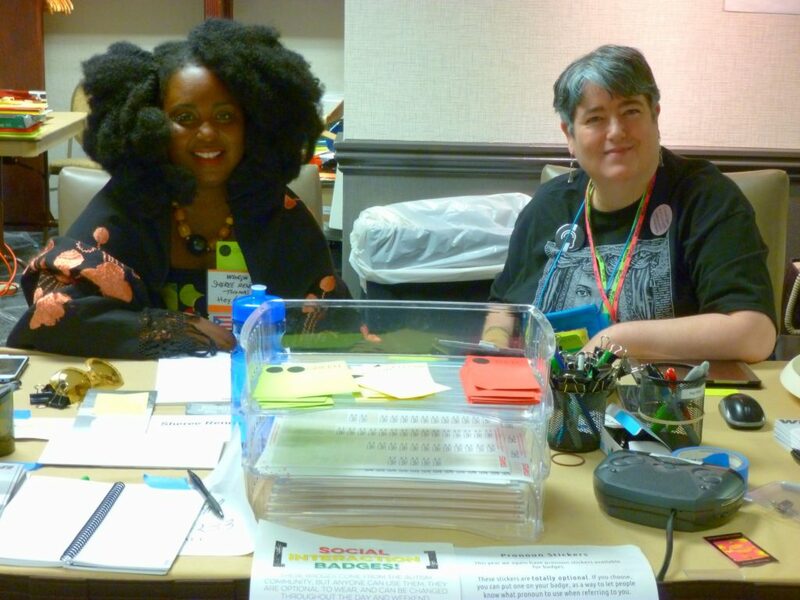 Calling the Concourse: 1-800-356-8293 — Make sure you mention WisCon when making your reservation. All the information about the hotel and room reservations is at http://wiscon.net/hotel/. We get a great discount on rooms, with a single room starting at $117, and a Governor’s Club room starting at $199. The Governor’s Club rooms are on the top three floors of the hotel and include access to a private lounge with free continental breakfast, hors d’oeuvres, desserts, coffee, and drinks. If you can afford it, consider checking in on the Thursday before the convention and enjoying the whole day on Friday. The last day to get these rates is April 26, or whenever the room block fills up. If money is tight, you still have options. The most important one is the WisCon Affordability 6th floor room discount. You can enter the lottery to receive one room night FREE by emailing Affordability. More information is on this page. The deadline to enter is April 20. If you’re a regular WisCon attendee thinking about long-term affordability, the Concourse has a rewards program: Points can be redeemed for gift cards, upgrades, and even free nights! Just ask at the front desk or check out the application at the bottom of this page. Now is a good time to mention that the Concourse will also be selling food discount cards during the convention. The card is $10.00 and can be purchased at the hotel front desk. The discount is good for 20% off at CIRC Restaurant, The Bar, and room service. And it’s reusable for the duration of the convention, even if you’re not staying at the hotel. WisCon has been held at the Concourse Hotel since 1995 and we have a great relationship with the hotel management and staff. You can read all about the hotel on their website. Being able to stay in a room in the Concourse Hotel is one of the pleasures of WisCon — and also one of the biggest financial barriers to attending the convention. As part of our commitment to affordability, each year WisCon is able to provide a limited number of rooms with discounted rates. We hope that offering this discount can help just a few more people get to WisCon by making your stay a bit more affordable. Though we call it a “discount,” the way it actually works is that WisCon will pick up the tab for the Sunday night of your stay. To be eligible, you must be staying at the Concourse on Friday, Saturday, and Sunday nights. You may be staying longer, but must at least be staying on these three nights. We generally have 5 double rooms (with 2 queen beds) available on the the sixth floor, although the number, type, and location of the rooms may vary slightly from year to year depending on what space the convention needs for programming. Because the number of discounted rooms is very limited, we make these rooms available through a lottery system — details below. Because the rooms that are marked as “eligible discounted sleeping rooms” are on the sixth floor, that puts them on the same floor where many of the parties are held in the evenings and also where the safer spaces and the Con Suite are. This means that there’s more noise generated by foot traffic, elevators, and so on. If you are someone who needs a very quiet room with not many people passing by at all hours, then the discounted rooms may not be a good fit for you. We are accepting requests through April 22 (closing at 11:59pm Central Time). After the request window closes, we will get in touch to let you know if your request is filled. Entries which do not supply all listed information will not be entered into the lottery. Please limit submissions for the discount lottery to one entry per party. WisCon is just 13 days away — and if you have a hotel reservation that you don’t need, now is the time to contact the Concourse to cancel it! The Concourse’s cancellation policy is: A reservation must be canceled by 4pm Central Time 7 days prior to arrival, otherwise you’ll be charged 1 night. If you do need to cancel your reservation, call the Concourse at 1-800-356-8293. The Concourse does keep a waitlist of reservations who booked at a higher rate and would like to move into the WisCon room block, so canceling your reservation could help another WisCon member save money. If you’d prefer to transfer your unneeded reservation to another member, you can often connect with someone who needs a room by dropping a note in one of the communities mentioned on our Hotel page under “Want roommates?” or by posting to the WisCon hashtags (#WisCon, #WisCon40) on Twitter. We are 51 days away from the start of the best weekend of the year and our hotel block has filled up — but don’t despair! The Concourse has an overflow block that is a slightly higher room rate than regular block: $145 single on the Concourse level and $225 single on the Governor’s Club level. Overflow reservations will automatically move into the regular, lower-priced room block if there are any cancellations before April 25. Beyond that, there may also be some regular-priced rooms available. You can also ask to see if there are any Governor’s Club rooms still available in our regular room block, though be aware that all Governor’s Club rooms have a single king-sized bed. This might accommodate 4 if you’re very, very friendly. Happily, they also have room for a twin-sized (single) cot. If the hotel does fill up or you desperately need a lower-priced room, you can check the fan-run communities on Dreamwidth and LiveJournal or the WisCon-Talk Google Group. As the con gets nearer, people often offer up reservations they can no longer use. The deadline for the regular block and the overflow block is April 25, but you can transfer rooms to other guests at any time while keeping the rate in effect when you originally made your reservation. Simply call the hotel to tell them you are transferring your reservation and give them the name of the person you wish to transfer it to. That person will then need to call to give the hotel their credit card information. Voila! If you have a reservation that you don’t need, now is the time to call the hotel to release it back to the room block or offer it up on one of online venues listed above. Our hotel page also has an up-to-date list and a map of other hotels some of which offer shuttle service downtown for easy access. As always, if you have any questions or concerns, drop us a line at rooms@wiscon.net. See you soon(ish)! Hotel update — Do you need a room? We have rooms! As of this writing, we are 72 days away from the start of the pre-convention meeting with hotel staff (not that I’m counting…) and we still have rooms available in our hotel block at the Concourse. Yes! We still definitely have rooms in our block at the Concourse. Ignore any rumors to the contrary! (As of our Feb. 26 update from the Concourse, there are also Governor’s Club rooms available, too.) The easiest way to book a room in our block to get our room rate is using our reservation link right here, but if that gives you any sass — it doesn’t connect or it claims there are no rooms remaining — then you can go ahead and call the Concourse directly and they’ll take care of everything (because we do still, really!, have rooms available!). Their toll-free number is 1-800-356-8293. The WisCon group rate is available through April 25! If you have reservations for more rooms than you can use, please contact the hotel to release whatever you don’t need. If the room block fills up, you can also transfer the reservation to another member. If you visit the LiveJournal community, the Dreamwidth community, and the WisCon Talk Google group people often post queries and offers for rooms as the days count down. If you find that you need to cancel your reservation closer to the convention, we ask that you do so at least seven days prior to your scheduled check-in. It is the Concourse’s policy to charge one room night plus tax for stays canceled without a seven-day notice. There are a limited number of cribs available for the use of our guests for a relatively nominal fee. As well as cots — also for a nominal fee — that are surprisingly comfortable and can, if properly situated, turn one bed in the room into a MEGABED. This is probably more exciting to me than it is to you. If you have any hotel-related questions (or wish to book me for your piano bar party! ), you can contact me at rooms@wiscon.net! Calling the Concourse: 1-800-356-8293 — If you have a hard time getting our room rate via the web reservation system, please call! WisCon has a room block with special rates at the Concourse that lasts through the date given at the top of the page. The Concourse has two types of rooms; Governor’s Club is a little fancier and includes access to the Governor’s Club lounge. WisCon makes a limited number of rooms eligible for one free night during the convention. Read more details in the Affordability section of the website, here. Try looking online at the Wiscon Dreamwidth Community, the Wiscon Livejournal Community, and the Google Group “Wiscon Talk” for room share or room transfer opportunities. The Concourse hotel is accessible to those with disabilities. For detailed information on accessibility, please see our Access page. All hotel rooms in Wisconsin are smoke-free by law. Check-in time is 3pm; check-out time is 12pm on Sunday and Monday and 11am on Tuesday. The Concourse has a swimming pool, open till 1am, as well as a whirlpool and steam room. The Concourse has an underground parking garage, but it is not free; currently, overnight guests pay $15.00 a night, and day users can pay up to $17.00 a day. A much less expensive public parking ramp is available just across the street from the Concourse. Circ, the hotel restaurant, is open for breakfast and lunch from 6:30am-2pm and from 5-10pm for dinner. The bar (also known as The Bar) is open from 2pm-1am Monday-Friday and 11am-1am Saturday and Sunday. Room service operates from 6:45am-11pm Monday-Friday and 7am-11pm Saturday and Sunday. The Concourse Hotel is undergoing some renovations. We’ve created an all-hotel edition of eCube to let you know what’s changing.